Mobile devices may strengthen the use of Augmented Reality outside of today’s industrial applications. For example, in the context of architecture or interior design, virtual furniture or windows could be placed in real rooms. For a believable manipulation of an augmented real world, both a photorealistic rendering generated in real-time and natural, seamless forms of user interaction with the virtual objects are needed. These are two essential criteria for the success of Augmented Reality applications, which are the main research focus of the IPAR project. The basis is the measuring of the complex, real lighting conditions that serve as input for the real-time lighting of the virtual objects. Besides altering seemingly realistic virtual objects, this also allows to virtually manipulate real objects under consistent lighting. With regard to human computer interaction, on the one hand indirect techniques are examined, where modern, hand-held tablets serve as so called “Magic Lenses”. Analogous to a camera display, they represent windows into the virtually augmented reality, allowing the user to manipulate objects on the fly. 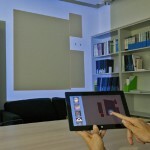 On the other hand, direct gestural interaction techniques in combination with mobile projections onto real objects are also being developed and evaluated. 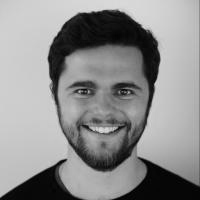 Besides research questions on the measuring and modeling of temporally and spatially varying lighting in indoor environments, the research project also deals with the challenges arising from this seamless integration for both user interaction and acceptance. 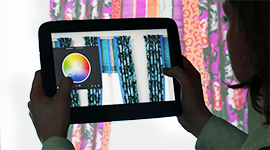 Foldable3D: Interacting with 3D Content Using Dual-Display Devices. 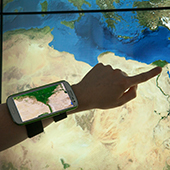 Smart Ubiquitous Projection: Discovering Surfaces for the Projection of Adaptive Content. Interactive Near-Field Illumination for Photorealistic Augmented Reality with Varying Materials on Mobile Devices. SleeD: Using a Sleeve Display to Interact with Touch-sensitive Display Walls. 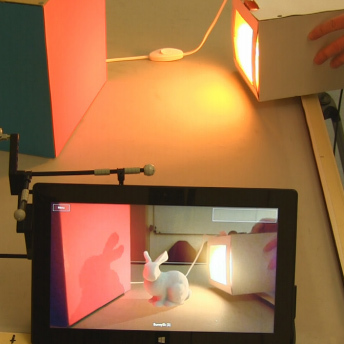 Interactive Near-field Illumination for Photorealistic Augmented Reality on Mobile Devices. 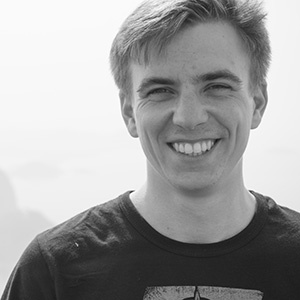 tPad: Designing Transparent-Display Mobile Interactions. cAR: Contact Augmented Reality with Transparent-Display Mobile Devices. 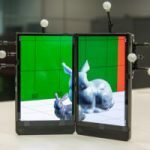 Tangible displays for the masses: spatial interaction with handheld displays by using consumer depth cameras. Towards Interaction with Transparent and Flexible Displays. In CHI 2013 Workshop on Displays Take New Shape: An Agenda for Future Interactive Surfaces.CHI '132013.